The German version of the book now also has an Amazon page. It sells me as “Ketzer,” meaning “heretic.” Well, I guess I indeed make some blasphemous remarks about other people’s beliefs. Chris Lee has reviewed my book for Ars Technica. He bemoans it’s lacking dramatic turns of plot. Let me just say it’s really hard to be surprising if your editor puts the storyline in the subtitle. It seems there will be an audio version after all. Will let you know if details emerge. When I was in New York last year, the Brockmans placed me in front of a camera with the task to speak about what has been on my mind recently, just that I shouldn’t mention my book, which of course has been the only thing on my mind recently. I did my best. Frankly I expected the 2.5 σ gift to quickly join the list of forgotten anomalies. But so far it has persisted, and it seems about time I unwrap this for you. Evidence for quantum gravity is hard to come by because quantum fluctuations of space-time are so damn tiny you can’t measure them. To overcome this impasse, Afshordi and his collaborators looked at a case where the effects of quantum gravity can become large: Gravitational waves produced by black hole mergers. 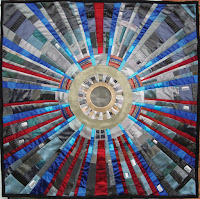 Their idea is that General Relativity may not correctly describe black hole horizons. In General Relativity, the horizon bounds a region that, once entered, cannot be left again. The horizon itself has no substance and indeed you would not notice crossing it. But quantum effects may change the situation. Afshordi and his group therefore studied that quantum effects turn the horizon into a physical obstacle that partly reflects gravitational waves. If that was so, the gravitational waves produced in a black hole merger would bounce back and forth between the horizon and the black hole’s photon sphere (a potential barrier at about 1.5 times the Schwarzschild radius). This means the waves would slowly leak out in each iteration rather than escape in one bang. If that’s what’s really going on, gravitational wave interferometers like LIGO should detect echoes of the original merger signal. 2.5 σ means that roughly one-in-a-hundred times random fluctuations conspire to look like the observed echo. It’s not a great level of significance, at least not by physics standards. But it’s still 2.5σ better than nothing. Afshordi’s group extracted the echo signal from the LIGO data with their own analysis methods. Some members of the LIGO collaboration criticized this method and did their own analysis, concluding that the significance is somewhat lower. Afshordi’s group promptly complained the LIGO people make misleading statements and the results are actually consistent. You see they’re having fun. Bottomline is there’s some quarrel about exactly what the level of significance is, and exactly what’s the right way to analyze the data, but the results of both groups are by and large comparable. Something is there, but at this point we cannot be sure it’s a real signal. I will admit that as a theorist, I am not enthusiastic about black hole echoes because there are no compelling mathematical reasons to expect them. We know that quantum gravitational effects become important towards the center of the black hole. But that’s hidden deep inside the horizon and the gravitational waves we detect are not sensitive to this. That quantum gravitational effects are also relevant at the horizon is speculative and pure conjecture, and yet that’s what it takes to have black hole echoes. But theoretical misgivings aside, we have never tested the properties of black hole horizons before, and on unexplored territory all stones should be turned. Indeed the LIGO collaboration has now included the search for echoes into their agenda. There is even another group, this one in Toronto, which has done their own scan of the LIGO data. They found echoes at 3 σ. The Toronto group’s analysis has the benefit of being largely model-independent. But they advocate the use of periodic window-functions which induce spurious periodic signals. The authors show that in certain frequency regimes the side-effect of the windowing can be neglected and that in simulations they were able to extract the actual signal. But I suspect it will take more than this to convince anyone that imposing a periodic signal on data is a good way to look for a periodic signal. 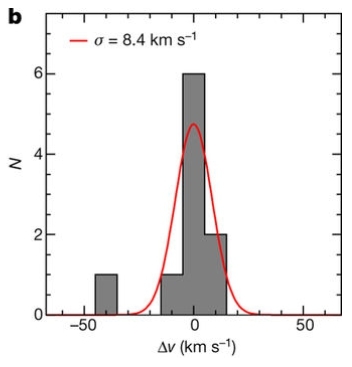 Afshordi and his collaborators meanwhile have put out another paper, claiming that indeed the evidence is as high as 4.2 σ. That’s a pretty high significance, inching close to an actual discovery. I am, however, not convinced by their latest study. The reason is that the more they doctor on their model, the better they will get at finding specific types of echo in the noise. To correctly evaluate the significance they’d then have to take into account the number of different models which they tried. Without doing that, the significance is bound to increase simply because they’ve tested more hypotheses. So I’d advise you to not read too much into the 4.2 σ. On the other hand, the LIGO people probably tried very hard to make the signal go away but didn’t manage to. Therefore I think at this point we can be confident there is something in the data. But to find out whether it’s more than just funny-looking random fluctuations, we will have to wait for more black hole mergers. I am giving (another) seminar in Heidelberg on Wednesday (April 25th), this time about my upcoming book. May 1st is a national holiday in Germany (labor day) and I’ll be off-grid due to family affairs for some days. May 7th to 9th I am in Stockholm to get yelled at (it’s complicated). 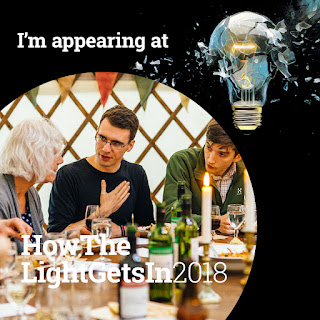 On May 26th I am in Hay-on-Wye which is a village someplace UK that hosts an event called How The Light Gets In at which I am supposed to debate how “the pursuit of beauty drive[s] the evils that hold back a better society.” I wouldn’t go as far as calling grand unification an evil, so please don’t judge me by the tagline. I have also been asked to share this image below. Hope it makes more sense to you than to me. On May 28th I am giving a public lecture in Dublin at the Irish Quantum Foundations conference. In summary this means May will be a very slow month on this blog. Guest Post: Brian Keating about his book “Losing the Nobel Prize"
Illustration by Stephan Schmitz for Nature. When I saw Sabine had finally gotten round to reading my book, I was thrilled! This is sure to be an awesome review from a fellow-traveller: a first-time author herself. Gulp. 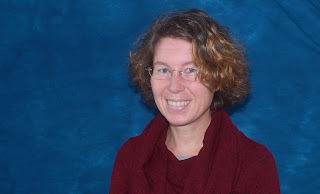 After reading Sabine’s blog, I immediately regretted not taking my editor’s advice. But, Sabine was kind enough to offer me a chance to reply to her review (a review of a review?) so here goes. First off, speaking of not reading things, the cover of the version I sent to Sabine explicitly says “don’t quote without checking against the final version” (See the white cover version in the upper left hand corner of this photograph on Medium). Unfortunately, Sabine never read the finished version. In fact, the few times I asked her about her progress reading the “ADVANCE UNCORRECTED” review copy’ book sent to her in August, she only replied “I’ve not started it”. Fair enough, she was writing her own book about things being Lost. And she did pass it on to a German publisher on my behalf, which was terribly kind of her. But the version Sabine read was not even proof-read, nor copyedited, nor fact-checked. Right on the cover it implores the reader to “not quote for publication without checking against the finished book”. This is something she, as an author, probably should have realized before writing her review. I’ve reviewed multiple books for fellow physicists long before writing my own -- as has she -- and always make sure to cross-check against the final version(s) [plural because often I’ve read and listened to the audio book before writing my review]. But, what about the substance of her review? Well, much of what’s inaccurate about it stems from unwarranted or incorrect assumptions. For example, she complains that I did not inquire as to what “Swedish Royal Academy has to say about the reformation plans”. First of all, I’m not sure how she could possibly know with whom I’ve been in communication with...she’s not Zuckerberg! How’s that for seeing what “they have to say”? Some of this appears in the final book version. I agree with her: I’m not convinced anything will come of it...until the day the Nobel Prize in physics is boycotted or sued. And I think that day is coming. It really not that perplexing, Sabine. The Nobel Prize is a global event, not just a simple Swedish smorgasbord. The prize for peace, for example, is for world peace, not merely to implore Norsemen to stop making war with their many conniving enemies, right? Fact: According the Nobel Foundation, 100 million people tune into the festivities each year...ten times the population of Sweden and about 10% of the audience the Oscars receive. Winners become celebrities and the Nobel Committees revel in the fame and adoration the events receive. Why, they’re even moving into a brand, spanking new $150M building in Stockholm next year, designed by a fancy architecture firm, for all their many festivities (the old venue is too small apparently). The Nobel Prize leaders and the King recognize the power of the prize. It is not only science’s greatest accolade, it’s the greatest one humanity has to offer as well. As such it should be held to a higher standard. With respect to the many comments others have made about me having sour grapes, no one who reads the book could come away thinking I actually still want to win it. Of course, after reading Sabine’s review, many have cancelled their orders so they may never learn! But even that notwithstanding, I’m often criticized for writing about it without having won the Nobel. I find that a bit silly. Can one not criticize Harvey Weinstein without being an member of the Academy? Can one not criticize President Trump if one has not been president? I don’t need to have clairvoyance into the netherworld because Alfred did it for me. It is abundantly clear what he wanted and all three of these rules are routinely ignored and have been for over a century. 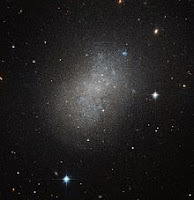 As for the power of the prize to affect the judgement and career choices of scientists, let me just say it affects non-astronomers too: "With physicist Peter Mansfield, Lauterbur in 2003 bested Damadian to Nobel recognition of magnetic resonance imaging (MRI). This outcome prompted the appearance of full-page ads financed by the Friends of Raymond Damadian in a number of newspapers, including The New York Times.” [emphasis mine]. Wherever there is an idol, people will bow down to it, the Nobel is no baal [Warning: another Old Testament reference], but it is no exception either. In the book I am advocating that more theorists should win it, and experimentalists should not win it if they/we merely confirm a theory...that leaves them/us susceptible to confirmation bias. For reference, this was in the copy Sabine read. Alas, time is fleeting and the launch of my book is few short days away, so I must take leave of back reacting. But I am thankful that Sabine has permitted me this chance to address some of her concerns. And I am grateful for the many kind words she did employ in her review. I enjoy your work and I wish you best of luck with your book...may you never read a review you have to react to! Brian Keating hasn’t won a Nobel Prize. Who doesn’t know the feeling? But Keating, professor of physics at UC San Diego, isn’t like you and I. He had a good shot at winning. Or at least he thought he had. And that’s what his book is about. 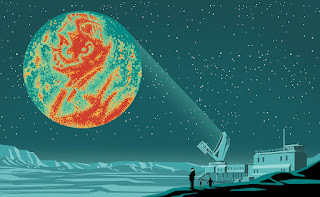 Keating designed the BICEP telescope, whose upgrade – BICEP2 – made headlines in 2014 by claiming the first indirect detection of primordial gravitational waves through B-modes in the cosmic microwave background. Their supposed detection turned out to be contaminated by a foreground signal from dust in the Milky Way and, after a few months, was declared inconclusive. And there went Keating’s Nobel Prize. In his book, Keating tells the story of the detection and its problems. But really the book is about his obsession to win the Nobel Prize and his ideas for reforming the award’s criteria. That’s because Keating has come to the conclusion that pursuing science to the end of winning a Nobel prize is no good, and he doesn’t want his colleagues to go down the same road. He also doesn’t think it’s fair to hand out the prize for maximally three people (who moreover should be alive) because by his own accounting he’d have been fourth on the list. At best. 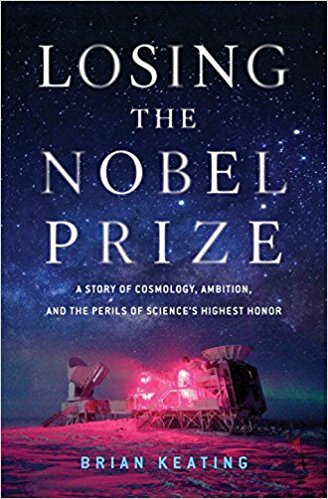 “Losing the Nobel Prize” is well written and engaging and has a lot of figures and, ah, here I run out of nice things to say. But we all know you didn’t come for the nice things anyway, so let’s get to the beef. I have found Keating’s book outright perplexing. To begin with let us note that the Nobel Prize is not a global community award. It’s given out by a Swedish committee tasked with executing the will of a very dead man. Keating apparently thinks he knows better what Alfred Nobel wanted than Alfred Nobel himself. Maybe he does. I don’t know, my contacts in the afterworld have not responded to requests for comments. In any case, you’d think if someone writes a book about the Nobel Prize they’d hear what the Swedish Royal Academy has to say about the reformation plans. But for all I can tell Keating never even contacted them. His inside knowledge about the Nobel Prize is having been invited to nominate someone. Keating doesn’t mention it, but the club of those eligible to submit nominations for the Nobel Prize is not very exclusive. Every tenured professor in the Nordic countries (in the respective discipline) can nominate candidates. Right, that’s not very equal opportunity. Fact is the Nobel Prize is unashamedly North European. And North Europeans in general, with Swedes in particular, don’t care whether US Americans like what they do. I’d be surprised if the Royal Academy even bothers responding to Keating’s book. Even stranger is that Keating indeed seems to believe most scientists pursue their research because they want to win a Nobel Prize. But I don’t know anyone who has ever chosen a research project because they were banking on a Nobel. That’s because at least in my discipline it’s widely recognized that winning this award doesn’t merely require scientific excellence but also a big chunk of luck. 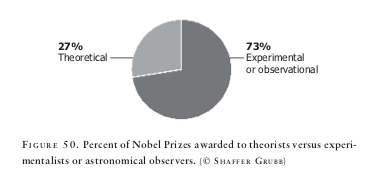 Maybe Keating is right and Nobel obsession is widespread in his own discipline, experimental astrophysics. But no such qualifier appears anywhere in the book. He is speaking for all of science. “Battle is an apt metaphor for what we scientists do.” And according to Keating, it’s not Nature’s reclusiveness that we battle but each other. And it’s all because everyone wants to win the Nobel Prize. Keating at some point compares the Nobel Prize to Olympic Gold, but that’s a poor comparison. If you wanted to compare the Nobel Prize to say, discus throw, you’d have to let 99.9% of discuses randomly explode right after being thrown. And when that happens you disqualify the athlete. In my experience, while almost everyone agrees that Nobel Laureates in Physics deserve their prizes, they also acknowledge it matters to be at the right place at the right time. And since everyone knows talent isn’t the only relevant factor to win the Prize, few hold grudges about not winning it. It’s really more a lottery than a competition. Having said that, even after reading the book I am not sure just how Keating proposes we think about the Nobel Prize. While he uses analogies to athletic competition, he also compares the Nobel Prize with the Oscar and with a religious accolade, depending on what suits his argument. Possibly the reason for my difficulty understanding Keating is that he assumes his readers know what’s the fourth and fifth commandment and what was up with that Golden Calf in the Old Testament. I may know what B-modes are, but that one beat me. He also lost me at various other places in the book where I just couldn’t figure out what’s going on or why. For example, I guess pretty much everyone who reads the book will know that BICEP failed to measure the signal they were after. Yet the reader has to wait until Chapter 14 to hear what happened there. Chapter 15, then, is titled “Poetry for Physicists,” contains some reflections on how we’re all made of stardust and so on, praises Jim Simons for funding the Simons Observatory, mentions as an aside that Keating will be the Observatory’s director, and ends with a poem about dust. The next chapter is slap back to Nobel’s will and then goes on about the lack of female laureates. If follows an image of Keating’s academic genealogy, and then we are transported into a hospital room to witness his father’s death. If that sounds confusing it’s because it is. There are so many things in the book that didn’t make sense to me I don’t even know where to begin. Keating for example suggests that the Nobel Prize only be given to “serendipitous discoveries,” by which he means if a theorist predicted it then it’s not worthy. You read that right. No Nobel for the Higgs, no Nobel for B-modes, and no Nobel for a direct discovery of dark matter (should it ever happen), because someone predicted that. Bad news for theorists I suppose. The culprit here seems to be that Keating (an experimentalist) doesn’t believe theory development has any role to play in experimental design. He just wants rich guys to crank out money so experimentalists can do whatever they want. The most befuddling aspect of this book, however, is that Keating indeed seems to believe he had a chance of winning the Nobel Prize. But the Nobel Prize committee would have done well not handing out a prize even if BICEP had been successful measuring the signal they were after. B-mode polarization from primordial gravitational waves would have been an indirect detection of gravitational waves, but there was a Nobel Prize for that already and being second doesn’t count. And in contrast to what Keating states in the book, this detection would not have been evidence for quantum gravity because the measurement wouldn’t have revealed whether the waves were or weren’t quantized. Neither for that matter, would it have been evidence for inflation. As Keating himself notes in the passing by quoting Steinhardt, models for inflation can predict any possible amount of B-modes. He doesn’t mention it, but I’ll do it for him, that some models without inflation also predict B-modes. So the claim that B-modes would be evidence for inflation is already wrong. Even worse, Keating repeats the myth that such a detection would moreover be evidence for the multiverse because that just sounds so spectacular. But it doesn’t matter how often you repeat this claim it’s still wrong, and it isn’t even difficult to see why. If you want to make any calculation to predict the B-mode spectrum you don’t need to begin with a multiverse. All you need is some effective theory in our universe. And that theory may or may not have an inflaton. My point being simply if you don’t need X it to make prediction Y, measuring Y isn’t evidence for X. So, no, B-modes aren’t evidence for the multiverse. I don’t personally know Brian Keating, but he’s on twitter and he seems to be a nice guy. Also I got this book for free, so I want to warmly recommend you buy it because what else can I say. If nothing else, Keating has a gift for writing. And who knows, his next book might be about not winning a Nobel Prize for Literature. 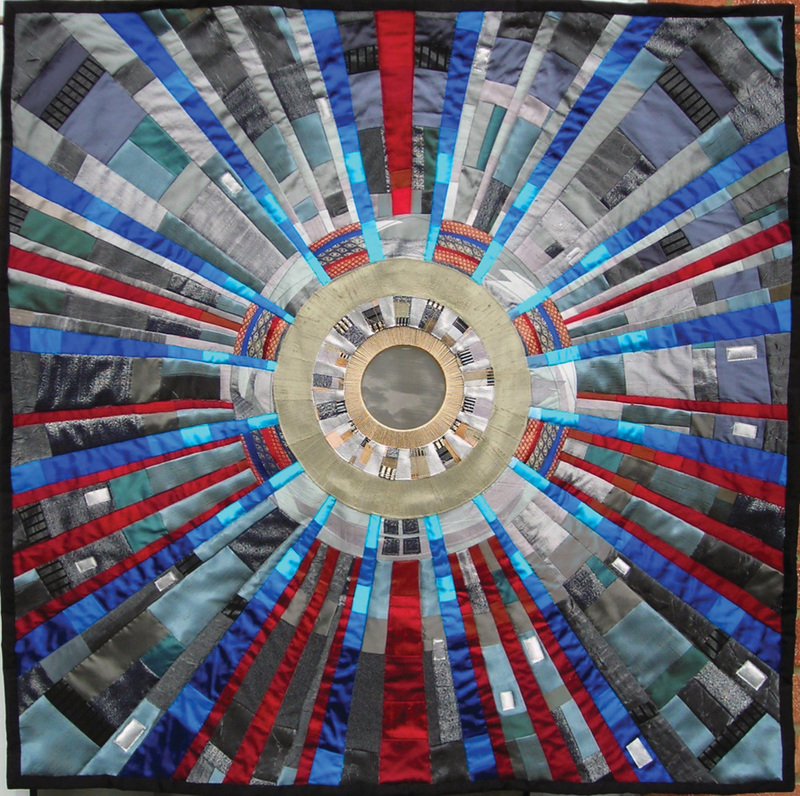 Collider quilt. By Kate Findlay. Nigel Lockyer, the director of Fermilab, recently spoke to BBC about the benefits of building a next larger particle collider, one that reaches energies higher than the Large Hadron Collider (LHC). The argument Lockyer is referring to are calculations of quantum corrections to the Higgs-mass. Ie, he is making the good, old, argument from naturalness. Meanwhile Gordon Kane, a US-Particle physicist known for his unswerving support of supersymmetry, has made an interesting move: he discarded of naturalness arguments altogether. You find this in a paper which appeared on the arXiv today. It seems to be a promotional piece that Kane wrote together with Stephen Hawking some months ago to advocate the Chinese Super Proton Proton Collider (SPPC). Most importantly, quarks come in pairs that are SU(2) doublets. This means once you have the bottom quark, you know it needs to have a partner. If there wouldn’t be one, you’d have to discontinue the symmetry of the standard model which was established with the lighter quarks. Supersymmetry, on contrast, has no evidence among the already known particles speaking in its favor. In my book “Lost in Math” I analyze how particle physicists got into this mess and also offer some suggestions for how to move on. Not sure how I missed “Farewell to Reality” when it came out. Indeed, I didn’t take note of Jim Baggott’s writing until I was asked to review one of his more recent books for Physics World. And having enjoyed that, I had a look at his previous books. His book is a well-researched and methodological approach to these speculative theories. Baggott first establishes a basis, spelling out what he will take the purpose of scientific explanation to be. Then he goes through the background knowledge (general relativity, quantum mechanics, standard model). Having done that, he evaluates whether the “fairy tales” are worth being taken seriously, concluding (unsurprisingly given the book’s title) that, no, they’re not. The book suffers somewhat from its rather heavy, philosophical opening chapter, followed by the inevitable but necessary terminology, but the later chapters pick up in pace. It takes some enthusiasm to get through the book’s first part. But this slow start has the benefit of making the book fairly self-contained; I believe you don’t need to bring more than high-school physics to make sense of Baggott’s explanations. which I think is entirely correct. Baggott is a gifted science writer whose explanations seem as effortless as I’m sure they’re not. He knows his stuff and isn’t afraid of clear words. And having noted this, it is not irrelevant to mention that Baggott is no longer working in academia; he has no reason to sell fairy tales as science. And he doesn’t. He’s a writer you can trust. While I am sorry I missed Baggott’s book when it appeared, I am glad I didn’t read it before writing my own book. It’s somewhat depressing to look at “Farewell to Reality” years after it was published and see that nothing has changed. 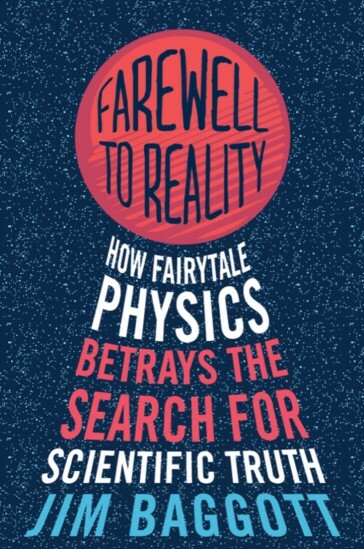 I would recommend “Farewell to Reality” to anyone who is looking for a sober assessment of what to make of all the interesting but speculative ideas that theoretical physicists have cooked up in the past decades. I also recommend of course that you buy my book. It covers some more topics that Baggott doesn’t discuss, such as models for inflation, dark matter, various approaches to quantum gravity, and what the absence of supersymmetric particles at the LHC means.